A brand new 45 min. movie for the theaters will be release in Sweden on the 27th September (2013). 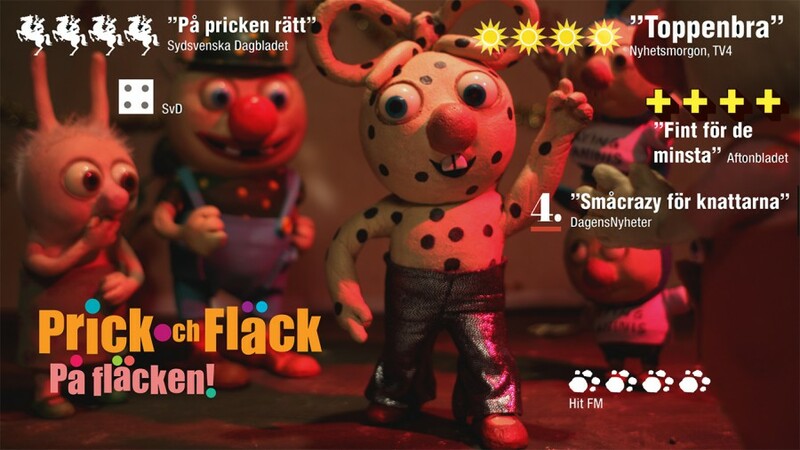 The Swedish title is “Prick och Fläck på Pricken” and the English title is “Spot and Splodge Plottspotting“. The films is a compilation of 6 adventures. Baking, Standing as in the circus on their ears, having Chicken-pox, going on a very special shoe sale, picking mushrooms in the forest and having a Disco party! The film will be released in 29 theaters all over the country with our distributor Folkets Bio, who will also use SF theaters. A more complete information about the film will be soon in here. Meanwhile you can visit our Facebook page for the last updates.